In John 6 Jesus said something very interesting. I want to focus on a couple of things in these verses. The first, it is the Holy Spirit who breathes life into the scriptures that we read. We need to depend on Him not our intellect and understanding. Jesus views them as flesh. The second is that we have the capacity to choose to believe. With this as a foundation I want to look at another passage. There is a lot in these three verses. Key is that all the wisdom and knowledge we need are contained in the Father and in Jesus. So how do we access this wisdom and knowledge? Paul, like Jesus, tells us it is by the Spirit. In the two verses above Paul’s echoes what Jesus taught in John 6. The deep things of God are revealed to us by the Spirit, not by our own understanding or reasoning. That is not to say we don’t use our understanding and reason, we just need to learn how to submit them to the Holy Spirit. Have you ever had the experience of reading a verse many times on many occasions, then one day you see and it comes alive? That is what Paul is referring to. In recent years Identity Theft has been a growing concern in western society. Yet if we look at church history Identity Theft has long been a major issue with significant impacts. Paul addressed this in Colossians 2. Paul’s point here and many other places is that as Christians our identity should be found in Jesus. Anytime our identity is found in something other than Jesus we know we are to some extent missing the mark. We know we truly understand our completeness in Him when it leads to humility and understanding we are complete in Him not because we are worthy but because He is faithful and glorious. What are the implications of seeing ourselves complete in Him? What is the power of this one sentence? Think about it. If we are complete in Him then our identity and sense of status is not in our position, our intellect, our physical features, our income, our marital status, our social status, or our possessions. I could go on but my point is that great transformation that can come in our lives simply from reflecting on two short verses of scripture. What do these verses tell us? The whole of the Godhead, Father, Son and Spirit are embodied in Jesus. If we want to understand the Father, He is revealed in Jesus. If we want to understand the Spirit, He is revealed in Jesus. If we want to understand what His goal is for our lives, it is revealed in Jesus. What else to do know from these two verses? As the Head of all principalities and powers Jesus has authority over all the power of the enemy that seeks to undermine and destroy our lives. As we rest in our identity in Him we know that final victory is assured. So, take some time and rest in this small portion of His word and it will lead to encountering His presence and a right identity. The writers who share their Throne Room experiences with us, even though inspired by the Holy Spirit, do not present a picture that is easy to understand. While the Holy Spirit wants us to know something of this experience, at the same time language cannot do the experiences justice. It is said that ‘a picture is worth a thousand words.’ Yet Jesus is the Word and the primary method He has chosen to communicate with us is via the written word. However, this word only truly releases life when breathed upon by the Holy Spirit. At the same time that He has given us His word He has also communicated the experiences of others and described heavenly eternal realities because He wants us to know about them. The pictures below illustrate the challenge of people conveying what they think Ezekiel saw, the wheel within a wheel, or Daniel’s vision of the Ancient of Days. While I like the pictures I know they are not accurate. At the same time both convey something of the majesty and awe of this eternal realm – the eternal fire issuing forth from the Godhead is captured as well as eternal motion (the wheel) which is reminiscent of gyroscope and may be what the writers were trying to describe. While they focused on different aspects of the throne room, if we read Daniel’s account below we see that Daniel saw what Ezekiel saw, who saw what Isaiah had seen and in Revelation John looked into the same scene. Daniel saw this fiery being seated on a throne among thrones. In our modern church age we have many who claim experiences of heaven. While that is not the norm for Christians it doesn’t fall outside the scope of scripture. I have serious questions in listening to some experiences, yet others carry the ring of truth. For me one was an experience I heard John Paul Jackson describe (he went home to Jesus in February 2015). 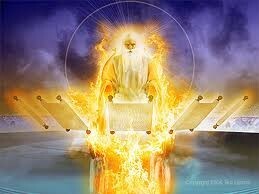 Like Paul he did not initiate this experience, he was taken to the throne room. Part of what he described, other than a great fear of the Lord, was seeing the fiery seraphim travelling at great speed around the throne crying out ‘Holy, Holy, Holy!’ What John Paul described was seeing them moving rapidly liking electrons orbiting the nucleus of an atom. 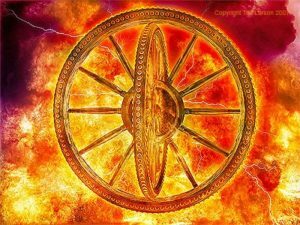 This was the first description that ever made send to me of Ezekiel’s description, “The appearance of their workings was, as it were, a wheel in the middle of a wheel.” (Ezek. 1:16). What does this tell us? Our Father has beautifully woven into the design of His creation a model of the small natural parts (an atom nucleus of neutrons and protons being orbited by electrons) reflecting the eternal spiritual realm so that we know one came from the other. Other than sitting before the throne room by faith, one of the greatest things we can draw from this is confidence that He is in charge and on the throne. If we truly love Him and embrace His purpose all things that come into our lives will work together for our good (Rom. 8:28) because He is conforming us to the image or His Son. We can rest confidently in His work and purpose. In my last post I wrote about what David saw in the wilderness. What I didn’t address was the why or how. I think David saw because he was spiritually hungry. A large portion of the Psalms, written mainly by David, but also by others, flowed from the continual 24 hour worship before the Ark of the Covenant. David had daily access to the Ark and Yahweh’s abiding presence when in Jerusalem. I believe losing this, the rebellion of Absalom, and his concern over the nation made him more acutely aware of how much he needed Yahweh’s presence. I think his ability to see was because of his history with Yahweh combined with his prophetic gift. In our day we have longings expressed in worship as well. We have the fairly recent Jesus Culture song Show Me Your Glory. In recent decades we had I Want to see Jesus Lifted High, The King is Here and many others. We have many traditional hymns such as Turn Your Eyes Upon Jesus. They all express similar longings. Does this longing mean we can see as David did? Can we go beyond just sitting before Him in faith and expectation if we are truly hungry? The answer is not explicit. We don’t know what state Paul was in when he described experiencing ‘visions and revelations of the Lord.’ We do know that twice in this brief passage he uses the term ‘caught up.’ Paul was taken up, he didn’t just wake up and decide he was going to the third heaven. Similarly we know that prior to the unveiling of the book of Revelation and seeing the throne room John was ‘in the Spirit’ (Rev. 1:10) when these things took place but Jesus initiated the interaction and revelation and John’s seeing into the throne room in Revelation 4 was his looking in response to Jesus invitation to come up. Also, John said that seeing into the throne room happened when he was ‘in the Spirit’ at Jesus initiation (Rev. 4:1-2). In my own experiences of sitting with Jesus, while I can imagine what the Throne Room might be like, I have never seen anything. I have however experienced a lot and still do. Without seeing it just by focusing my attention I am physically conscious of the eternal realm. Perhaps this is what Helen Lemmel referred to when she wrote ‘Turn Your Eyes Upon Jesus’ or what Paul referred to when he prayed that through Spirit of wisdom and revelation the eyes of our heart or understanding would be opened. I don’t think Paul expected every believer to have a third heaven throne room experience, yet it is clear from his prayers in Ephesians 1 and 3 that he expected us to experience Jesus and His love, not just possess information about Him. My marriage would be quite empty if I possessed information about my wife but had no real experience of our relationship. Whether we know it or not we truly need to ‘know’ Jesus. So, are we seeking an ongoing encounter with our King? Having looked at what are some obvious examples of throne room experiences what about one that isn’t obvious? Though I can use most bible translations there are some I have more confidence in that others. I personally use the NKJV for the textual basis underlying the translation and the more literal approach to translation. The NASB and ESV are similar in terms of their approach, they just translate from a different textual basis. An important note is that while most of the textual differences are in the NT they don’t change any major doctrine. More than the underlying text it is the approach to translation that determines what we receive in our current language. This is my long introduction to Psalm 63:1-2. The importance of the theology of the translator comes into play when we read scripture in any but the original languages (the OT was written primarily in Hebrew with some Aramaic, the NT in common Greek). So, to Psalm 63. The most accurate translation above in verse 2 is blending the HCSB and ESV so we have, “So I gaze on You in the sanctuary beholding your power and glory.” This leads to two questions. Why is the tense important? What period did David refer to when he wrote this Psalm? David fled to the wilderness on two occasions, first when he was being pursued by Saul prior to becoming king. The second occasion was when Absalom rebelled against David and David fled into the wilderness for safety. In verse 11 David refers to himself as the king so this Psalm would have been written when he fled from Absalom. The significance of the context and tense is that David refers to the sanctuary, yet there was no sanctuary in David’s day (the Hebrew literally refers to the Holy Place). David created a place of worship in Jerusalem when he set up the Ark of the Covenant on Zion, the high point in Jerusalem (it was where Solomon later built the temple). The previous sanctuary was the Tabernacle of Moses and it had a Holy of Holies but what made it holy was God’s glory dwelling between the cherubim on the Ark of the Covenant, which was now in a tent on Zion in Jerusalem, while the Tabernacle of Moses remained in Gibeon (1 Chron. 16:1-4, 37-39). So what is my point in all of this? David had a throne room experience while in the wilderness. The present tense tells us he was not using his imagination to gaze upon the Ark of the Covenant, a symbol of the true one in heaven, David was gazing at what Isaiah and Ezekiel saw. So can we do this? If we have the Holy Spirit dwelling in us we can through an act of faith sit in His presence, open up our spirit and interact with our God who is a consuming fire! In this posture we can ask Him for a spirit of wisdom and revelation (Eph. 1:17) and trust Him to change us from glory to glory (2 Cor. 3:18) and see more of His character revealed in our lives. While we may not see as David, Isaiah or Ezekiel did, we can be changed in ways they never were. What a privilege we possess!